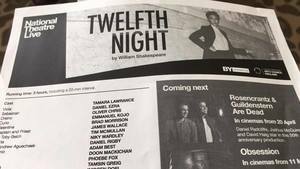 Normally not a fan of productions that tamper with Shakespeare as written, I went with some trepidation to the three-hour version of "Twelfth Night" at The Quick Center for the Arts. The broadcast was part of the National Theater Live series, which provides across-the-pond access to some of this London theater’s most important work. For $25, free parking, and a 15-minute drive. Director Simon Godwin took liberties with the Bard in several ways: He set the piece in modern times, he changed Malvolio to Malvolia (brilliantly portrayed by Tasmin Greig, who stole the show), and added a stunning drag queen crooning a torch-song version of Hamlet’s “To be or not to be” soliloquy in a down-and-out piano bar on the wrong side of the Ilyrian tracks. Although divinely executed and wildly entertaining, I found that last bit forced and over the top. Perhaps most importantly, Godwin made overt and obvious some of the proclivities implied more subtly in the comedy as written. While Shakespeare often uses cross-dressing as a ruse and subterfuge, Godwin's brave staging threw this 505-year-old play right into confrontation and conversation with current issues. Viola and Sebastian (played by Tamara Lawrence and Daniel Ezra) looked more androgynous than male, raising the important question of why or if outward appearances need to define us at all. Antonio (Adam Best) and Duke Orsinio (Oliver Chris) – two of the arguably most ‘masculine’ characters, express blatant homosexual curiosity and tendencies here. Antonio wears a skirt vaguely suggestive of a kilt and clearly has a crush on Sebastian. Orsinio loves Viola masquerading as Cesario, Viola as Viola, and Sebastian as Sebastian. Again, this production seems to ask, why does the definition of gender matter in matters of the heart? Sirs Toby Belch and Andre Aguecheek – both ostensibly hetero in the story line – are fabulous, flaming fops in this version. The two most repressed characters, Olivia (Phoebe Fox, the weakest acting link in an otherwise stellar cast) and Malvolia struggle most mightily. The former is veiled in self-imposed mourning celibacy. The latter allows her OCD and closeted homosexuality to limit her. When they ‘come out’ into themselves, they are free. Olivia appears in staid black for most of the play, but when she allows love in, she transforms, butterfly-like, into a rainbow of flouncy, frilly ruffles. Malvolia, outed involuntarily, suffers a crueler coming out party but ultimately rises to the occasion and does so literally on the spectacular and versatile set that was as much of a character as any of the flesh and blood actors. She becomes more herself and stronger as she ascends the stairs, looking up and welcoming the cleansing rain, than she was when she was conforming to society’s stultifying expectations of her. So… I stand corrected and reprimanded. This version of "Twelfth Night" reminded me that I must keep an open mind when it comes to Shakespeare’s work. I see something vastly different and consistently universal in each production. And so, we all must keep an open mind when it comes to unexpected, unconventional, and unfamiliar versions of people. It is only a good thing to see something vastly different and consistently universal in them, too.